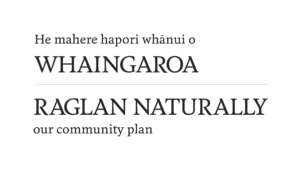 Whaingaroa has always been a whānau centred community with a focus on relationships, culture and the environment. For youth, the small town vibe increases the sense of connectedness between them as further helps to foster a sense of uniqueness and individuality about the community as a whole. Youth also appreciate that there is a lot of support behind promoting the importance of both culture and the environment with local stories and history underpinning the community identity. Whaingaroa currently has the potential to provide many opportunities for youth; however, no strategy exists to capitalise on these opportunities to create support systems for the youth population. School leavers often move away from the Whaingaroa township to access education, accommodation or employment if they cannot access in their home town. A rapidly growing community with a big influx of new residents, there is a need to prioritise support for youth in Whaingaroa. The Ministry of Youth Development defines youth as young people, aged between 12 – 24 years old. Current national priorities include: increasing the number of opportunities for youth development; increasing proportion of opportunities targeted to youth from disadvantaged backgrounds; working in partnership with business and philanthropic organisations to jointly invest in shared outcomes; building formal recognition of young people’s community and voluntary participation by recording and valuing. WDC has committed to engaging youth by integrating young people into our community more and giving them a platform to air their views. At the moment approx. 1300 youth in Waikato district. Māori make up 24% of the total population in our district and 31% are youth aged between 10 and 24. This makes Māori youth a key group that council wants to make a positive impact on. Creating a district where youth feel valued and engaged in local government matters will encourage youth to stay, potentially retaining social capital. This means that new skills acquired by youth through learning and training would be retained in our district and more people would be proud to continue living in the Waikato. NZ Stats 2013 (waiting 2018) : 13yrs – 33people | 14yrs = 21 people | 15-19yrs= 135 people | 20-24yrs = 102 people. Youth Focus Group: Rangi Rongo, Grace Mindoro, Jai Debesten, Sahara Leng-Ware, Kaea Ruawai, Awatea Dillon, Charlie Irvin-Thomson, Sven Seddon, Lexie Holmes, Tehiata, Josh, Lisa Thomson, Shannon Kelly, Maree Haworth, Carla Eyre and Jah, Annie Lorenzen, Margaret Dillon, Angeline Greensill, Sasha Kroon, Charlie Irvin, Bex Hollows, Sarah Edwards, Daniel Kereopa and Renee Davenport, Fiona Edwards, Karamea Puriri, Maryann Tuao, Tiaki Coates, Naomi Tuao, Brian Ruawai, Deb King, Fiona Bolden, Maki Nishiyama and Gabrielle Parson (and others). Advocate and deliver quality services to young people over longer periods, Youth Services Sector workshops, skill based training. Promote services, program and projects working with the whanau and Youth in priorities in parenting, drugs, alcohol, relationships and social emotional, wellbeing. Facilitate a connection between the youth services and education services sector to discuss identified gaps in life’s skills, education and support. Social media of all youth services/providers/events/projects – set up a Youth Trust. Youth HUB /van – connect with other Youth Hubs outside of Raglan ward, workshops, skill based training, youth events. Partnership with community business and tourism sector – employment. Youth as a resource within our community and partnership in community projects, sharing resources. Facilitate between the youth services and education services sector – to discuss identified gaps in Youth’s – life’s skills, education and support – budgeting, cooking, cleaning etc. Mana whenua, Local youth, Educators and influencers, Service providers, Change makers, Iwi community, Tangata whenua, Local Youth, Raglan Area School, Parents, Educators, service providers, funding bodies, local government, local committees and decision making bodies, local business owners, mentors and influential people, local sports groups and clubs, Karioi Maunga, Chamber, Community House, Arts Organisation and groups, Te Mauri Tau, Raglan Community radio, WEC, Chronicle, Brian and Naomi, Ruth Hare, Patti Mitchley, Natasha Rao, Rick and Liz, Daniel K and Renee, Coastguard, Schools – Te Uku/Te Mata/Waitetuna/RAS, Poutama Tane, West Coast Health, Maraes. A diverse community with a global-village feel, there are many talented individuals in our community that could contribute to the overall outcome of youth development tin Raglan. The youth in the community have a strong awareness of cultural and environmental values. National and regional youth services (Real Waikato, Zeal etc), local counsellors, budgeting, Health, Mental Health, Creative development. There are a number of funding organisations that are relevant to Raglan and the Waikato region, specifically (Raglan Community Charitable Trust, Lions Club, Raglan Community Board, WDC, WEL Energy, DIA – Lotteries, Trust Waikato, local business Community Cash Funds) as well as project based and youth-specific funding and support opportunities. (Creative Communities NZ, Ministry of Social Development, Ministry of Culture and Heritage, Community Matters Org, Ākina, Vodafone, Tainui, Maori Trusts etc. Youth Reps, Surfside Youth, Poutama Tāne, Leadership Programme -Akaroa, Youth Week, Gateway programme, Star Courses, Council Youth Engagement and Action plan, Sports groups, Karioi Maunga, Te Mauri Tau, Soundsplash, Te Ao Marama, Feed the Kids (Margaret), Maui Dolphin Day, the Arts, School Gala Days, Matariki Celebrations, Recreational and Enviornment Youth Groups, New Year Parade, Christmas In The Park. No specific space for youth (youth hub gone) – Opportunity to rethink new space with future focus. Drop in kohanga and roopu numbers (connection to culture, heritage) – Opportunity to rethink how we can incorporate Te Tiriti values into our community and education that is relevant for youth. Opportunity to educate and learn. Rapidly changing demographic means sense of community identity can change. Opportunity for youth to start conversations about the future of Raglan. More diversity means more opportunity for connections with new ideas and people. How does this challenge impact on Youth? How do Youth impact this challenge? What is the opportunity for Youth in relation to this challenge? Opportunity: New business or enterprise based on sustainable practices, learning, connection and collaboration, innovation and technology. Impact: Widening inequality gap sees more affluence in Raglan. Pressure on multiple resources can lead to displacement of local families from the community. Many different world views and value systems flowing in to the community can mean a changing dynamic. Opportunity: Opportunity to find and protect vulnerable members of our community and find/create support. Telling the stories of Raglan, both new and old, to educate and create a common ground. Opportunity: New skills in the community, new business opportunities as growing population, new connections, learning and education. Opportunity tolearn and educate about Raglan history. Impact: Lack of information and education could create resistance to change. Opportunity: Shifting to a new understanding about individual and collective identity. Questions from the Youth – Rangatahi Group1. What do youth like about Raglan today?2. What are youth’s happy spaces today?3. What do you youth want in Raglan to meet their present needs in this community?4. What do youth not want to see happen in Raglan, in the present and the near future?5. What do youth want to in the future and the next generations to come in this community, 5 years, 10 years? Over 100 of you have offered your time, expertise and support to this process. It’s been wonderful working with you all.